Released in 1971, Walkabout follows the tale of a sister and brother (Jenny Agutter & Luc Roeg) who are left stranded in the Australian outback and must survive in the wild in order to return to civilisation. They are aided by an aborigine boy (David Gulpilil), who is wandering and surviving in the outback alone as part of his traditional aborigine ‘walkabout’ ritual. The movie’s dialogue is sparse, with much of the narrative given over to the stunning and often hallucinogenic cinematography, which serves to emphasise the juxtaposition between the ‘developed’ industrial modern society and nature. Walkabout is based on a 1959 novel by James Vance Marshall, and was adapted for cinema by Edward Bond. It was directed by Nicolas Roeg, who was also responsible for the cinematography, and is also well known for helming seminal 1976 horror drama Don’t Look Now. Despite garnering little critical or commercial success when it was released, as the years have passed Walkabout has become celebrated as a not only one of the best ‘Australian’ movies ever, by also as a tour de force of creative and beautiful cinematography that showcases the true majesty of the Australian outback. The first scene I’d like to take a look at is this fantastically surreal shot of a butcher at work. The viewpoint offered in this scene is incredibly creative, and for me is indicative of Roeg’s whole approach to cinematography throughout the movie. Naturally, the most memorable thing about this shot is the slightly gory subject matter, which is partly what makes the shot truly memorable. We are not used to seeing close up shots of raw meat being prepared in cinema! As well as being an unusual choice for cinematic subject matter, the chicken is arranged in an interesting and unusual way. Notice how its head rests on the table as though asleep, contorted grotesquely under its body, with the head forming a perfect triangle that connects its body to the chopping block. Then there’s the brilliant creepy curled yellow foot right in the centre of the frame, which looks as though it’s some kind of weird mutant extension from the butcher’s hand as the leg extends out from between his fingers. The pink, red and brown hues of the blood smears on the chopping block and the butcher’s apron stand out against the white, and bring an extra element of gore to the scene. So despite being an interesting subject for a shot anyway, it’s clear that even the positioning of the chicken was arranged for maximum visual impact. Once the viewer has taken in the chicken as the subject matter of the photo, their mind then begins to move to other distinct elements of the scene. The camera lens here is peering through a porthole window in the display glass that makes for a really interesting frame within a frame around the chicken as the focal point of the image. Using objects within a scene to create additional ‘frames’ in a shot in which the focal point of interest in the scene takes place is a great way of drawing the viewer’s eye to a particular point in the scene and focusing their attention and is a ‘trick’ regularly employed by cinematographers, as I’ve mentioned in other Talk Movies articles. In this shot, the presence of the monotone white frame creates a large area of negative space around the edges of the shot, which forces the viewer’s eye to seek out colour in the scene, leading them to the chicken’s head and the butcher’s hand. Compositionally, the porthole ‘window’ showing the chicken is placed right dead centre in the middle of the shot, providing the scene with fantastic symmetry and geometry. The scene is largely dominated by white, pinks, reds, oranges and a splash of yellow. If we apply colour theory analysis the shot, we find that not only do the colours stand out very well against the white (as I’ve mentioned earlier), but also that the colours used in the scene are all harmonious to one another, which means they are all found next to each other on the colour wheel and their use together makes for a natural harmonious effect. The final element in this scene that should be examined is the butcher himself. The composition, point of view and the ‘frame’ from the porthole all serve to remove any trace of identity or even humanity from the butcher. Instead, all the viewer can see of him here is a tiny portion of his abdomen and his hand. This is unusual, and disruptive, and sets the viewer’s mind racing – what does the rest of the butcher look like? Peering through the porthole at just the butcher’s hand feels almost voyeuristic, and makes for a very immersive viewing experience. The way the hand reaches down from the top of the porthole is really surreal and bizarre, it’s like a weird claw reaching down from the heavens, which lends the whole shot a creepy, mysterious air. The key approach to applying the techniques from this shot to street photography is to always be on the look out for the strange, the gory, and the abstract. Seek out subject matter, compositions and points of view that are visually disruptive and confusing. Don’t be afraid to get in close, often you’ll need to leave things out of the frame which instinct would encourage you to leave in, but for a mysterious memorable shot what you choose to exclude from the shot can be as important as what you include. Look out for extra ‘frames’ which you can place around your subject matter and are also useful for excluding elements to make the shot more abstract. Hands are an excellent subject to focus on with abstract photos as they are often full of character – they can inform a lot about a person’s job and lifestyle in a subtle way, and are also very expressive. I’ve dreamed about making a shot that’s as weird, abstract, and memorable as the Walkabout scene I chose, and I’ve yet to achieve it! 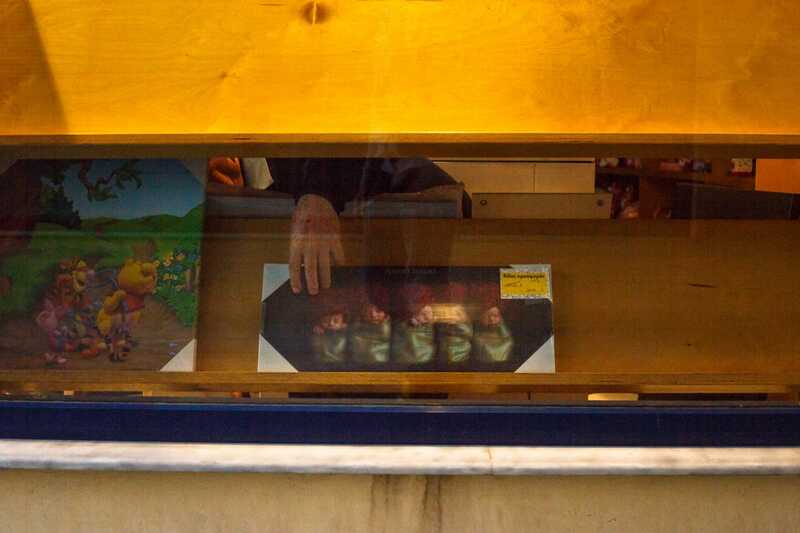 The closest I’ve come in style to that scene is this shot which shows a shop owner re-arranging canvases in a window display. My main subject matter isn’t nearly as interesting as the gory chicken, but I quite liked the weirdness of the line of babies on the canvas. With the hand reaching down it’s as though it is reaching down from the sky to steal one away! My shot is much more heavily reliant on geometry than the movie shot, as I used the strong straight lines of the shelves and the window frame because my photo is altogether much busier and lacking in simplicity than the movie scene, so I needed the geometry to add an element of order to the chaos! Rather than a porthole, the extra ‘frame’ in my shot is provided by the shelves, which unfortunately means that the lighting in my photo can get nowhere near the nice even exposure from the movie because the shelves cast a heavy shadow over the hand and canvas. In fact, this shot unfolded so quickly in front of me that there wasn’t even any time to alter any camera settings – I just had to compose and hope for the best. As it was, the exposure was way off, and I’ve had to bring the shot up by several stops in post-processing, but I thought it was worth it for this bizarrely surreal scene. 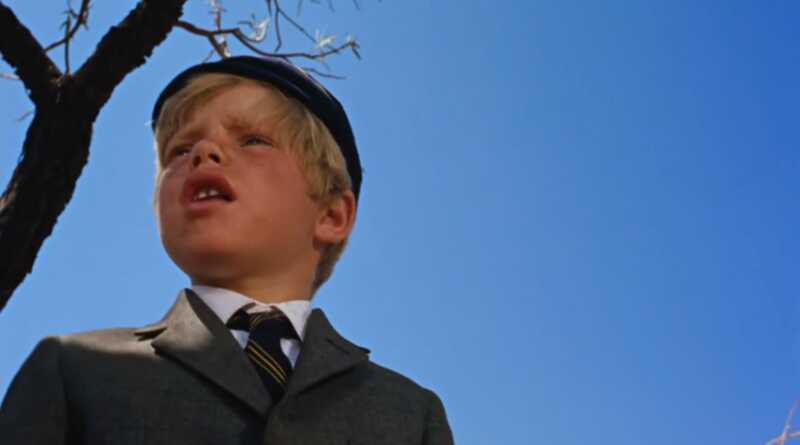 The second scene I’m going to look at from Walkabout is this really strong shot of the director’s son Luc Roeg, who plays the little boy. I love the simplicity of this scene, as it is arranged perfectly with no distracting elements vying for the viewer’s attention – all attention can be focused on the boy and his facial expression. For all the apparent simplicity here though, it is clear that this scene has actually been incredibly meticulously arranged in order to have maximum visual impact. If we look first at the composition, we notice that the director has adhered to our well-known rule of thirds principle for layout. He’s placed the boy to the left of the frame off centre, ensuring that two thirds of the right of the screen are occupied by the negative space of the sweeping bright blue sky. Leaving a huge portion of the frame empty like this not only makes the shot brilliantly simple, but it also guides the viewer’s eye across the frame as they desperately search out something that isn’t a flat featureless sky, happening across the little boy as the clear focal point of the entire shot. Rounding off the left corner of the frame nicely are the branches of the tree that fill any negative space between the boy and the left side of the shot, adding extra visual weight as an additional point of interest in this area of the frame, and making it extra clear that this is where the viewer’s attention should be focused in this shot. What makes this scene really stand out as a piece of filmmaking though is the fantastic viewpoint, and this in particular makes this a great shot for street photographers to study. The director has chosen here to film the boy from a low angle, providing the viewers with the different experience of actually looking up at a child. This low point of view lends the shot an entirely different feeling and has several effects on the viewer. The first effect is that it places more emphasis on the sky, heightening the negative space effect that I mentioned earlier. The second and most dramatic effect is that of surprise – this is not a ‘natural’ viewpoint, making it unusual and disruptive to the mind, which in turn makes it interesting and memorable. 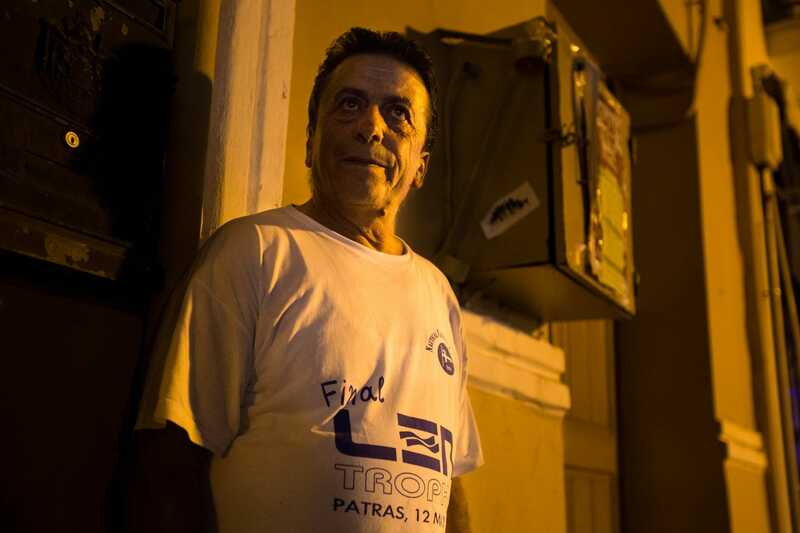 How can a street photographer emulate a shot like this? As photographers it’s far too easy for us to fall into the ‘trap’ of shooting all our photos at head height because this is what comes naturally to us. However, it’s important to mix things up sometimes and try experimenting with a rat’s eye view for a totally new perspective on things that can transform an ordinary mundane scene into something that looks totally surreal and abstract. So try out different viewpoints on the streets – shoot looking up at people from below and you’ll find that their features can transform! You don’t just have to shoot from a low perspective either; you can also try looking down from stairs, balconies and overpasses to get a bird’s eye view instead. Also aim to make use of flat colours or features for negative space as the Walkabout scene does. Not only can you use the sky, but also walls painted a nice flat colour, or even billboards with simple backgrounds. As with Walkabout, I shot my photo from a lower point of view than usual, so that I’m looking up at my subject, although I’m not as close in to my subject as in the movie, which means that my shot loses a little immediacy and impact by comparison. Similarly, I didn’t have the benefit of a nice simple clean uncluttered background behind my subject to use negative space creatively – instead the wall behind the man in my photo is incredibly busy and full of distracting elements. One advantage I had compared to the movie scene was that my photo was shot at night, meaning that I was able to use a combination of shallow depth of field and the light from the streetlamp to go some way towards isolating my subject from the ugly background. The fact it was a night photo also meant my photo was higher in contrast which also helps to make up for the fact that it doesn’t have the movie shot’s simplicity. In contrast to Walkabout, my photo doesn’t contain a natural spectrum of bright colours. Instead, I opted to have my white balance slightly warmer than would be totally ‘accurate’ in order to emphasise the weird orange sodium glow of the streetlamp, which I feel adds an element of extra drama to the photo. Hopefully you’re able to take something away from my examination of two of these scenes from Walkabout. It’s a fantastic movie but also a challenging one, filled with references to the uneasy and often destructive relationship between modern industrialised society and the natural world. I am consistently astounded that some of the shots were even achieved using film in the early 1970s. Some of them are so precise, and rely on so many variables like wild animals, that they must have required hours and hours of patience and planning to achieve. 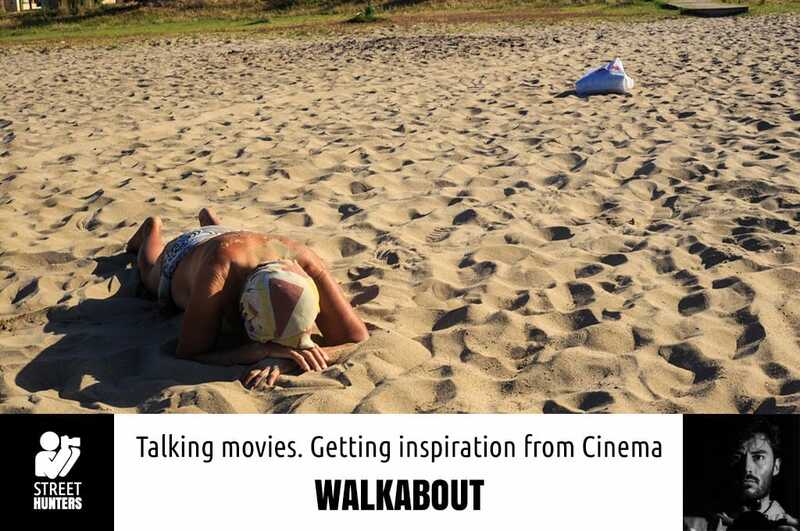 Walkabout is a stunning example of the expert and creative use of minimal composition and wide angle photography in cinema, together with some nature shots which put even the most modern nature documentaries to shame. I find it kick starts my creativity each time I see it, so I thoroughly recommend you give it a watch! Send in your photos from the 1st Annual Street Hunters Meeting in London! Enjoyed this, Digby. Made me want to re-explore the amazingly surreal ‘Walkabout’ again.